There are a few constants in the universe that you can always count on. Your DVR will always cut off the last 30 seconds of your favorite show. You will always hit traffic in the last hour of a two-day family road-trip. 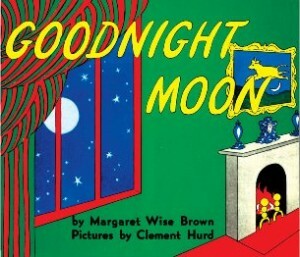 And, if you have children, you WILL own multiple copies of Margaret Wise Brown’s Goodnight Moon and The Runaway Bunny. It’s just a fact of life. We’re at the point now where OBY/GYNs should just issue new parents copies of Goodnight Moon and The Runaway Bunny along with their coupons for formula and free copies of What to Expect When You’re Expecting. 70% of the universe's missing dark matter is made up of copies of "Goodnight Moon"
This is not to say that either of these are bad books. On the contrary, Goodnight Moon and The Runaway Bunny are such ubiquitous baby reads because they’re really damn good. They’re gentle and genteel. They have this amazing rhythm to their text, which is somehow both calming and stimulating. As you read Margaret Wise Brown’s verses aloud, you can watch your child get sucked into the cadence of the words and the details of the illustrations and just see this sense of confident calm spread across their faces. Reading board books to the very young is a meditative experience, which, I’ll admit, I miss now that my daughter is older. And Goodnight Moon and The Runaway Bunny are the world’s most popular illustrated zen mantras for children. However, as I alluded to earlier, they are also probably the two most popular books in the world to give to new parents. We received multiple copies of each when our daughter was born, and both have become baby shower gift staples. If you know a parent who doesn’t have a copy of Goodnight Moon and The Runaway Bunny… something’s weird there. I’m not saying they’re bad parents or anything, but, just FYI, there’s a 70% chance that their marriage and new baby is a cover for a CIA training facility or a DEA deep cover operation. Note: Many of these books, including Goodnight Moon and The Runaway Bunny, exist in both in board book and hardcover versions. We have the board book versions of all of these works and I’d recommend the board editions, if only because it makes them a little more durable and explorable for kids 2 and under. 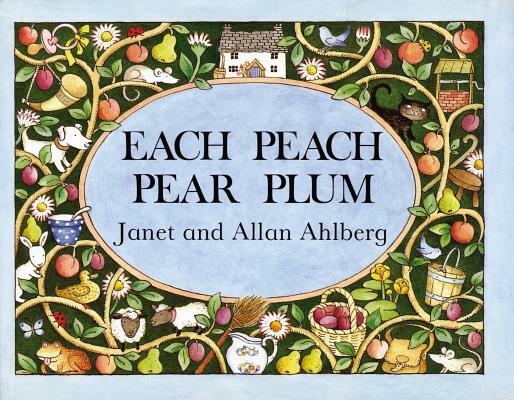 It’s hard not to like Each Peach Pear Plum by Janet and Allan Ahlberg, which probably stands as one of the most read board books in our library. The Ahlbergs have created a wonderfully interactive story that’s part nursery rhyme and part look-and-find for beginners. On each page, the authors ask the young readers to play “I Spy” to find some of the most iconic characters in early children’s lit, a series of happy-go-lucky characters that all meet in the end for a pie picnic. We begin with “Each Peach Pear Plum / I spy Tom Thumb”. After your child finds Tom Thumb reading on the branches of a peach tree, we turn the page to read “Tom Thumb in the cupboard / I spy Mother Hubbard.” This pattern continues throughout the book – one character in the foreground, one character hidden somewhere in the background – as we’re introduced to Cinderella, the Three Bears, Little Bo-Peep, Jack and Jill, Robin Hood, and more. Janet Ahlberg’s beautifully detailed illustrations will give your child wide, dense landscapes to explore, and the story actually works as a nice way to introduce classic literary characters to young readers. My daughter knew some, but not all of the characters in Each Peach, but rather than that being a negative, it actually made her even more interested in learning about the characters she didn’t know, which, as a parent, gave me a great in-road to introduce to her classic nursery rhymes and fairy tales that we hadn’t encountered yet. An extremely fun bedtime book. That absurd statement transforms into a really loving and funny exchange between a father and son, where Pete’s father creates a new game where he pretends to turn Pete into a pizza. It’s actually a very fun idea for a game – my daughter and I now turn each other into pizzas all the time. Pete’s father kneads his son, rolling him out like dough. He then tosses him, sprinkles him with oil (it’s really water), adds some tomatoes (they’re really checkers), and, of course, there’s the stage in the recipe where the pizza just has to be tickled. Shrek and Sylvester are classic literary works, but there’s something about Pete’s a Pizza that, as a father, I just really responded to. The facial expressions of Pete’s family are so expressive and intimate, and the story does an amazing job of capturing the manic fun of a family playing together, inside on a rainy day, when someone has invented a simple new game that is really, really fun. 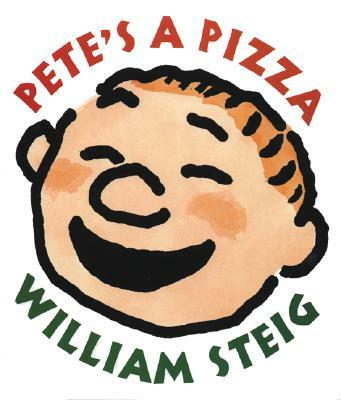 I can’t think of another book that does a better job of portraying the giddy fun of parents playing – really down-on-your-knees, getting-dirty PLAYING – with their children than Pete’s a Pizza. Any kid’s library worth its salt will have tons of alphabet books, but the trick is finding alphabet books that offer enough interesting material to make kids want to keep browsing through them once they’ve already learned their ABCs. 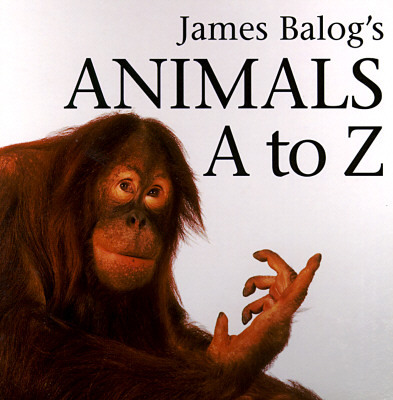 One of our favorites is James Balog’s Animals A to Z. Balog is an award-winning nature photographer – spend some time on his website and prepare to be impressed – and, in Animals A to Z, he creates an animal alphabet out of his ridiculously-striking photographs of real life animals. The animals are all photographed in front of white backdrops, which makes it easy for toddlers to engage with their facial expressions and, in some cases, makes it look like the animals are ready to pop off the page. Balog also assembles a mixture of familiar and unusual animals to help draw in his young readers – “B is for Bear, C is for Crocodile, D is for…Drill?” Some of the photographs are breathtaking and they definitely inspired my daughter to want to know more about each animal. Why does the crocodile have such rough skin? What is an urchin? What’s the difference between a drill and a mandrill? When my daughter was younger, she loved this book for the cute animals and the letters she recognized. Now that she’s older, she loves it as nature book, which has inspired a wealth of new questions about the animal world. In my experience, at a certain age, kids want you to put away their “baby books”, but, in a few cases, they will specifically ask you to keep certain board books on their shelves. So far, James Balog’s Animals A to Z is one of those books. A few weeks ago, I wrote a 2,000 word love letter to Taro Gomi’s My Friends, a fantastic board book about a child learning about the world around her from a series of human and animal friends. Again, I can’t recommend it enough. Check out my magnum opus about this silly, simple picture book and place it on your shelf next to The Runaway Bunny. The “Little” books by Amy Krouse Rosenthal and Jen Corace are just exceptionally well-done and very funny picture books that all revolve around the same theme – children will never want to do what their parents want them to do. 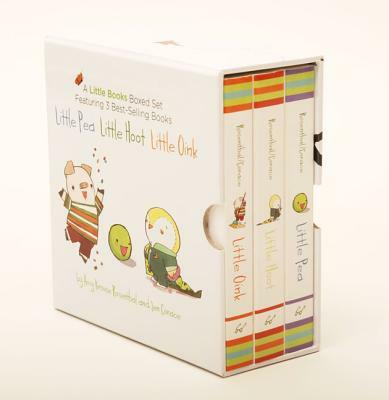 The first book in the series, Little Pea, sets up the format that the rest of the books will follow. We’re introduced to Little Pea, “a happy little guy” who likes to roll down hills, play with his dad, snuggle with his mom… there’s only one thing that Pea doesn’t like – eating candy. Because, as Rosenthal hilariously posits, “that’s what you have to eat for dinner every night when you’re a pea. Candy. Candy. Candy.” Granted, it’s a kind of a one-joke premise, but Rosenthal brings so much life to her characters and Corace’s illustrations are so packed with subtle humor that it’s one joke that keeps on delighting. And their follow-up titles, Little Hoot and Little Oink, are just as funny and do just as much with the same premise – little owls hate to stay up late and little pigs hate to be messy. Also, Sandra Boynton’s Hippos Go Beserk! (“One hippo, all alone, calls two hippos on the phone. Three hippos at the door bring along another four…) Fun early numeracy intro plus partying hippos. How about ‘Goodnight Gorilla’ or ‘Eating the Alphabet’? We also got some Sandra Boynton books which my son really enjoyed as a wee one. But I agree, the choice isn’t terribly original as a gift. Other favorites of mine are “Dear Zoo” by Rod Campbell and “The Color Kittens” (a lesser known M.W. Brown). Those are great suggestions. My daughter loves “Dear Zoo”, but we’ve never read “Color Kittens.” I’ll keep my eye out for it – Thanks! I think that this post is mischaracterized. When I think of shower gift board books, I think of the under-1 crowd. These books — with the exception of the Animal A-Z Book, are not directed to the Under -1 crowd. For example, the Little Pea/Hoot/Oink series is not enjoyed by the under-1 crowd. I enjoy these books, but none have yet to capture my 15 month old’s attention and only got my preschooler’s attention under he was over 2. The pictures are not bold enough, the rhythms not strong enough, and the concepts not simple enough. They may be printed as board books, but they are still geared to the over-1 crowd. 1. Books with photos of babies. Both of my kids loved books with actual photos of people. Their favorite is entitled “Happy Baby” and Gavin loves two others — one called “Smile” and “Hugs and Kisses.” Now, neither the narrative nor the photography is exceptional in any of these books. Indeed, it is all pretty terrible. However, there is something to be said for the fact I have had to read one of these books x4 week for 3 years. The void in decent books with pictures of babies makes for a fabulous opportunity for an aspiring children’s author with decent photography skills (or just a good camera.) However, I never put much effort into finding other books in this genre, because it’s not one I enjoy. 2. Sensory books. I like the “That’s Not My. . .” series. Indeed, we have That’s Not My Bear, That’s Not My Puppy and Este No Es Mi Leon (That’s Not My Lion.”) Pat the Bunny is the old standby that seems to appear at every baby shower and it’s spin offs, i.e. Pat the Puppy are equally fine. Also cute are the “Little. . .” Spider/Fish etc. . series, each of which includes a finger puppet in the center. 3. Elmo. What is it with that creature that seems to call to ever child between the ages of 10 months and 2 years? I avoid books with television characters, but on occasion — usually via a gift from Grandma — they sneak into our library. The Elmo board book title in our library is “Seseme Street Firehouse,” and it is likely the most read book in the house. Gavin loves Elmo and dogs and this book has both, so we read it over, and over and over. 4. Peak-A-Boo Books. Speaks for itself. For the post 12-month crowd, I would refer to the books as “Lift the Flap,” but for the under-12 month crowd, there are a couple of series of Peak-A-Book books. We have one related to bath time and another Seseme Street. Previous post: Sick Days are Over… for now….